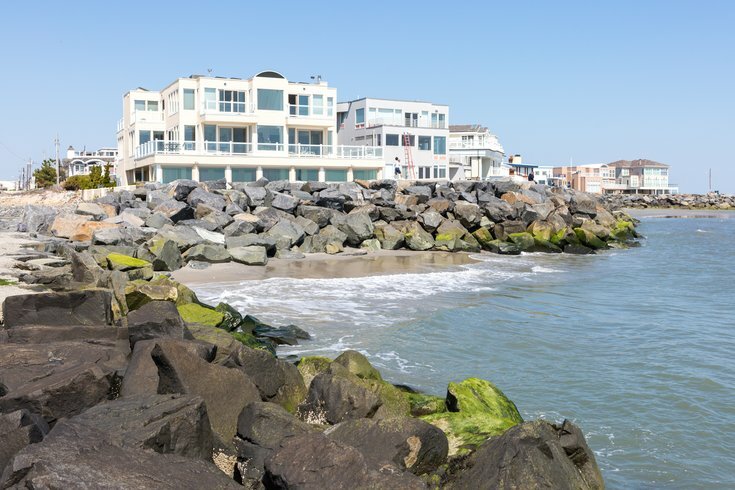 These oceanfront mansions are near the jetty at the southernmost point in Longport, New Jersey, giving them unobstructed views of the Atlantic Ocean and Ocean City. At the southern end of Absecon Island, Longport exists as a tranquil paradise, a place for those want the Jersey Shore to be more of a refuge than a bustling summer destination. During the colonial era, the beaches at Longport changed hands several times before developers recognized its promise as a resort town. James Long, the man for whom the borough is named, bought the New Jersey property in 1854 for $2,000 and a slice of land in Arkansas. At the time, it was known simply as Lot 32. Renowned Philadelphia lawyer and businessman M. Simpson McCullough purchased Lot 32 from Long in 1882, naming it after his friend (and for its legitimately long port on the bay side) with dreams of turning the area into a "seashore resort." The 20th century saw Longport transform from a largely commercial district into a small residential town. The famed Widener School Building served variously as an education center for severely handicapped children, an infirmary for soldiers returning from World War I and a famed local beach club before its eventual demolition. It's now home to 12 beach block homes known as the Widener Reserve. Today, Longport is a quiet place to enjoy the beach for its own recreational merits. Its positioning nearby Ocean City, Margate, Ventnor and Atlantic City make it a perfect home base for an extended trip to the Jersey Shore. Below is the latest weather forecast for Longport, New Jersey, and here is surf report from monitors at the shore town's 32nd Street Beach. Pre-season beach tags are currently on sale at a discounted price of $15 at Borough Hall (2306 Atlantic Ave.) from 9am-4pm, Monday through Friday, until June 15. After that, the regular seasonal price is $30. Seniors 65 and up can obtain beach tags for $5 during preseason and $10 for regular season. Children under 12 are not required to have a beach tag. Beach tags can also be purchased or reserved using the free Viply app. Lifeguards will be on duty at all guarded beaches from 10 a.m. to 6 p.m. except during inclement weather. The borough reserves the right to change lifeguard locations during the season. For more information, contact the Longport Beach Patrol here. Dogs are only allowed on the Longport Dog Beach located at Route 152 and Ocean Drive Bridge. Swimming is permitted at guarded beaches in areas where lifeguards have indicated. No one is allowed on the beach between sunset and sunrise, and kite-flying is prohibited between the hours of 10 a.m. and 6 p.m.
Surfing is only permitted in areas designated by lifeguards. Longport offers free parking on all streets. The Longport Farmers Market will take place this summer on Saturdays from June 30 to Aug. 25 between 9 a.m. and noon at Longport Borough Hall, 2305 Atlantic Ave. The market sells fresh fruit and vegetables, local seafood, baked goods and artisanal food. It also features local wineries, handcrafted items and work from artists. A calendar of events maintained by the borough can be found here, and Downbeach Buzz also is a good reference for things to do in Longport, as well as nearby Ventnor and Margate. Borough of Longport municipal website | Atlantic County Tourism website | To request additional travel information, click here.